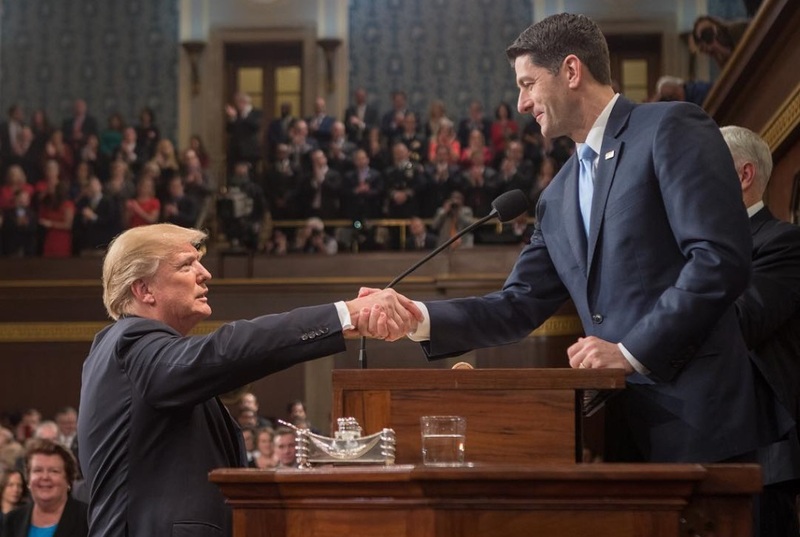 President Donald Trump and Speaker of the House Paul Ryan. Pulitzer Prize-winning columnist George Will, the longtime Republican once called “one of the most revered conservative thought leaders of our time,” has left the party he long supported and wrote a column Friday entitled “Vote against the GOP this November”. The column included stinging criticism of GOP stalwarts like Wisconsin congressman and House Speaker Paul Ryan for not standing up to President Donald Trump. As Will told Fox News, “After Trump went after the Mexican judge from northern Indiana, then Paul Ryan endorsed him. I decided that, in fact, this is not my party anymore. I changed my registration to unaffiliated 23 days ago… The long and the short of it is, as Ronald Reagan said when he changed his registration, I did not leave the Democratic party, the Democratic party left me. In his column Will declared that “The congressional Republican caucuses must be substantially reduced. So substantially that their remnants, reduced to minorities, will be stripped of the Constitution’s Article I powers that they have been too invertebrate to use against the current wielder of Article II powers” — referring to President Trump. As for “the melancholy example of House Speaker Paul D. Ryan,” Will wrote, he “wagered his dignity on the patently false proposition that it is possible to have sustained transactions with today’s president, this Vesuvius of mendacities, without being degraded…Ryan traded his political soul for . . . a tax cut.” Will compared Ryan to Richard Rich, the slimy weakling who betrays Thomas More in the play, A Man for All Seasons, in order to be appointed the attorney general of Wales. Longtime Republican Steve Schmidt, who ran the presidential campaign of John McCain in 2008, has also made a recent announcement that he is leaving the party and that Ronald Reagan “would be ashamed of Ryan and (Mitch) McConnell” for their support of Trump. Will has had a long association with Milwaukee’s Bradley Foundation, the largest funder of conservative intellectuals and policy making in the nation. He was an early winner (in 2005) of the annual Bradley Prize, he served for years on the foundation’s board of directors, and emceed the annual Bradley Prize ceremony in April, with Bradley President and CEO Richard Graber lauding Will. “His intellectual heft and award-winning commentary have had an immeasurable impact on American opinion and have inspired many of our current and future leaders,” Graber declared. The most effective change always comes from within. None of this stops until enough leaders of the GOP marginalize this disaster of a presidency and nationalist/populist wave. Dang, Bruce, you sure had fun writing this. Like giving Ryan a wedge. Now vote the rest of those spineless cowards out of office. McCain ran for President in 2008, not 2012. Time has passed George by. he was George HW type. Do little, keep order. George Will was just a tool of the right, is what I thought. His self righteous, pompous attitude irritated me I’ll have to cut him some slack. If a Republican can’t get George Will to vote for him, what next? Maybe others will get a backbone too.